The golf style that everyone loves! Home of the Links at Claremont Women&apos;s and Men&apos;s Golf Clubs. Sign up to receive specials and important Claremont news. Save some time by booking your next round of golf online! Regularly check our calendar for info about upcoming events. See how you can save some money next time you visit us. 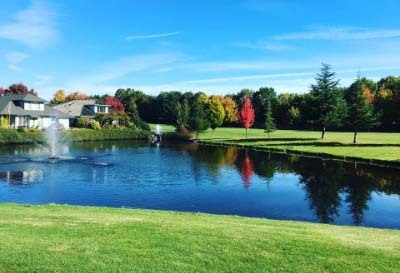 Claremont Golf Club in the Bethany area has been a favorite destination of Portland golfers for many years because of its well-groomed fairways and greens and its outstanding pace of play. A round here is just plain fun for everyone, so why not visit soon to find out why golfers love our course so much? Our nine-hole club is a regulation 3,077 yd course with two exciting par-5s and two par-3s that require your best strategy. This is a layout with interesting challenges for dedicated players, including risk-reward doglegs and lakes and ponds on several holes. But our course is also a great spot to learn for those beginning to play the game. Play nine or play 18 at Claremont – it’s up to you. A par-72 round with us is a special value that should become a regular part of your golfing life. We are proud of Claremont Golf Course. Come out and see us.